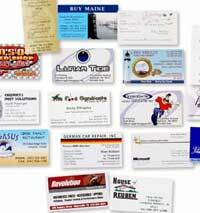 Make that first impression a lasting and powerful one with full color business cards from CMYK Graphix. For more information click on cards. Use 300dpi or better images converted to cmyk to achieve your best result. If our options don't match your needs, request a custom quote. Need help in the ordering process? Looking for multi-page publications? Click catalogs, books or newsletters.